Advice: Explore as many avenues and riding disciplines as you can. Be well rounded and don’t just stick to one thing. Every avenue is beneficial. August 2006 - Before she even knew a place like Meredith Manor existed, Julie Huffman Griffin earned an associate degree in business then worked as a media photographer at PGA golf tournaments and NASCAR auto races. While many people would consider that their dream job, Julie itched for something else. She wanted horses. So she began looking for a program that would give her the credentials she needed to succeed in the horse business. Julie says she considered four or five different schools with programs geared toward horses. Then she bumped into a graduate and learned about Meredith Manor. “When I graduated from high school, I didn’t know there was anything like a ‘horse school’ or I might have gone sooner,” Julie says. Julie chose Meredith Manor for the concentrated equine experience it offered her. At many other schools, she points out, students learn about stable management but they ride only once a week. By comparison, Meredith Manor students ride four times every day in addition to their intensive horse care practice. As an older student, she worried about living on campus with students right out of high school but, after observing the instructors and the classes, she recognized that the Meredith program was exactly what she wanted to do. Thanks to some networking help from Meredith Manor contacts, Julie landed her first job after graduation supervising the riding program at Camp Arrowhead, a boy’s camp in Flatrock, North Carolina. At first she was hesitant about teaching kids who didn’t know anything about horses. “Now,” she says, “I’d almost make it a prerequisite.” The camp had never had a riding instructor per se, just someone to supervise trail rides. She turned the program upside down, introducing riding skills, a safety program and parental involvement. Julie still supervises the program today. 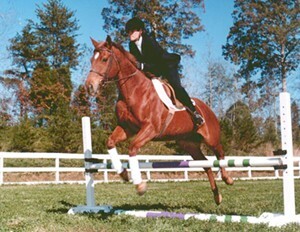 That teaching experience and the time management skills Julie learned at the photo studio both helped, she feels, when she applied for a management position at Steeplechase Equestrian. The owner wanted someone who could run the equestrian business while he ran his other businesses. When Julie arrived with a portfolio, certification, maturity and both business and horse experience, she not only got the job but also became a partner. Julie manages the 20-stall facility with responsibility for all the feeding, shoveling, and other daily care that horses require. She also runs a lesson program for over 20 youngsters, supervises the 4-H club she started at the barn, and trains horses for resale. Julie credits the intensive daily riding program at Meredith Manor for preparing her to manage her current workload.